The Regional Municipality of Durham was created January 1, 1974 as a Regional Government in the Province of Ontario under The Regional Municipality of Durham Act, 1973 of the Ontario Legislature. The Region of Durham is situated in the highly developed and populated economic centre of Ontario. Durham Region lies immediately to the east of the City of Toronto within the Greater Toronto Area and encompasses an area of approximately 2,590 square kilometres (1,000 square miles). The area is characterized by a variety of landscapes and communities. A series of major lakeshore urban communities contrast with a variety of small towns, villages, hamlets and farms which lie immediately inland. A recent report by the Planning Department estimates that the population of the Region of Durham was 531,000 in May 2001. A target of 760,000 people has been estimated for the number of people living in the Region by the year 2011, and a target of 970,000 people by the year 2021 – more than double the 1991 population. Pickering and Ajax are the municipalities with the largest immigrant population in the region, with 30% of the population being foreign-born. There is significant growth in the population identified as Sri Laken, Pakistani, African, and Romanian. 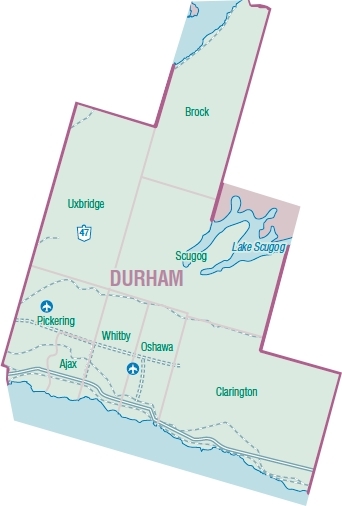 There are eight Area Municipalities in Durham Region (the Cities of Oshawa and Pickering, the Towns of Ajax, and Whitby; the Municipality of Clarington and the Townships of Brock, Scugog and Uxbridge). Each has its own website which can be accessed by clicking on the map or on the name of the individual municipalities.